Hugh Bowman has been hit with a month-long suspension following his ride on second-placed Marmelo in the Melbourne Cup. 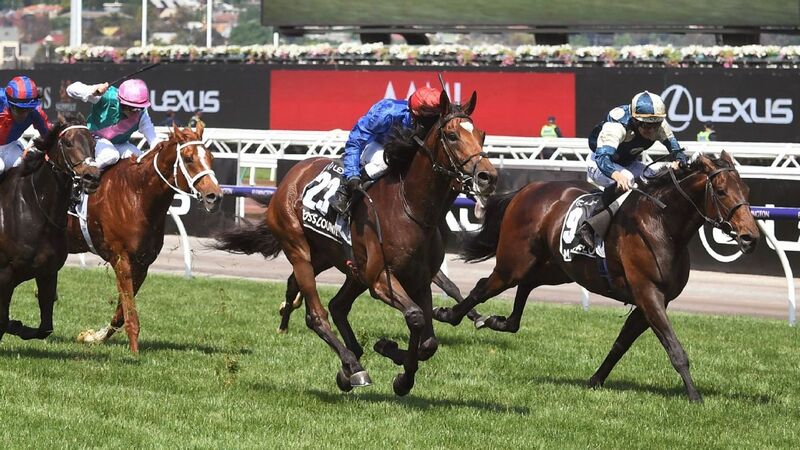 Bowman pleaded guilty to a careless riding charge, a charge of using the whip too many times before the last 100 metres and to weighing in one kilogram over his allotted weight. The weight charge carried the greatest penalty and would have been a concern to punters who backed Marmelo, which was swamped late in the race by the lightly-weighted Cross Counter. Marmelo was already giving the Goldolphin-trained winner four kilograms in the race, which is run under handicap conditions. Bowman copped a 12 meeting-ban for the careless riding, eight meetings for breaking the whip rule and 21 meetings for returning overweight. Stewards ordered the bans to be served cumulatively, before reducing the term by six days, to round it down to a calendar month. “We admire your horsemanship and your ability to ride, but that wasn’t up to scratch,” chief steward Robert Cram told Bowman. Bowman will now miss the chance to defend the Japan Cup on November 25, but he will be allowed to ride in Thursday’s Oaks day meeting at Flemington. He will saddle up Zapurler in the Group One VRC Oaks. Other Cup jockeys punished for breaching the whip rules included winning jockey Kerrin McEvoy, who was fined $3000, Regan Bayliss fined $1500, Dwayne Dunn and Damian Lane [$800] and Michael Walker [$400].